In this article I will explain How to Install VMware Workstation on Ubuntu Linux. The Workstation 14 is the latest version and for this tutorial I will be using Ubuntu 18.04 Desktop, But you can use this guide on Ubuntu 16.04 as well. Installing VMware Workstation on Ubuntu isn't hard to do. Actually, it's very easy. First, we need to download the installer, run the installer from the command line, then install with default parameters and it will work. Do the following steps to Install VMware Workstation on Ubuntu 18.04/16.04. Go to VMware Workstation download page and download workstation pro for Linux. The Linux installer should have ".bundle" extension. After the download is finished, Open the Ubuntu terminal, Use the cd command to go to the download directory and execute the ".bundle" file using sh command. Once you run the command, the graphical installer will be launched, from there you can Install VMware Workstation Pro with Next, Next, Next. In the first couple of screens you will be asked for license agreements, product updates and whether you want to join VMware Customer Experience Improvement Program (CEIP). In the next screen you can enter the name of a user account that will use for connecting to the VMware Workstation Server. This should be your username. Next, you need to choose a directory for shared virtual machines. Continue with the default location /var/lib/vmware/Shared VMs. In the next window, you enter the port to use for http access to the VMware Workstation Server. The default port is 443, but if you are running a web server, you'll have to choose a different port (Something above port 1024). Finally, you will be asked for the license key, this is optional. 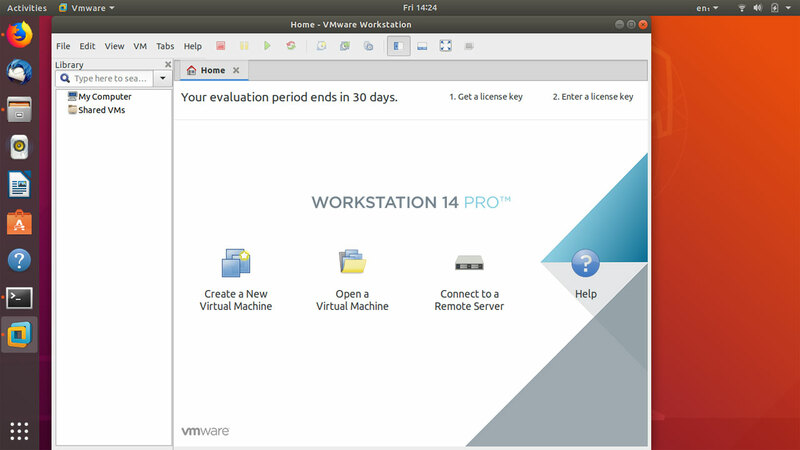 You can evaluate Workstation PRO on Ubuntu for 30 days without a license key. Click Next to Install VMware Workstation on Ubuntu. The Ubuntu VMware installation also includes VMware Player. the VMware Player is free for personal use, but lacks the advanced features such as the option to create snapshots and cloning virtual machines. Before you start creating new virtual machines, you may want to change default location where the virtual machines are going to be stored. By default it is inside your home folder on Ubuntu Desktop. To change the default location for VM's, Go to Edit > Preferences > Workspace and browse to the folder where you want to store new virtual computers. To create a new VM, Go to File > New Virtual Machine and launch the New Virtual Machine Wizard. Here you have two options, Typical and Custom. Continue with Typical option. In the next window, select "I will install the operating system later" and click next. Select the operating system you're going to install. Name the Virtual Machine and Change the default location if you want. Next, specify the size of the hard disk. At this point we are ready to create the new VM, you can click on Customize Hardware… button if you want change Hardware settings (You can always change these settings at any time). Once you're done, click on the Finish button to create the new virtual machine. To attach Installation media, right click on the VM and click Settings. On the Hardware tab, select CD/DVD. Here you can select the Installation disk (Optical drive or the ISO image of the operating system). Once you're done, save the settings and click on the Play button to start the virtual machine. From there everything is same as you familiar with it on a normal computer. VMware Workstation Pro is one of the most popular virtualization software and excellent type 2 hypervisor. But it is commercial software, After the 30 day period, you will have to buy a product license to continue on Ubuntu Linux. If you don't want to buy VMware Workstation, Then you can always use Oracle VM VirtualBox, which is Free and Open source virtualization software.